How to prove that you have previously predicted the star sign of a total stranger inside a packet of 12 Zodiac Sign Cards. Birthdated, in which you learn a combination of two techniques that allow one to always appear to be right, within a two month "range", about a prediction of the audience member's month of birth. Dogtagged, with some of the scripting provided by the legendary Caleb Strange. This has been previously published in other works and allows a theatrical event that ends with implying a secret military government connection with the bizarrist performer. Finally, the manuscript ends with the effect "Blue Shirt Syndrome" in which your volunteer predicts both the color of the shirt you have recently bought and the price you paid! 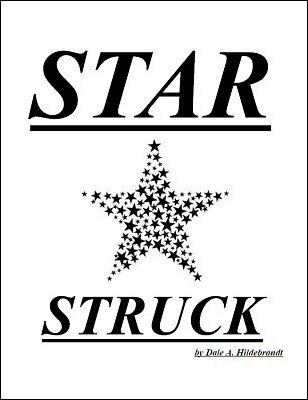 The real "meat and potatoes" of this manuscript is the title effect "Star Struck". This amazingly easy to memorize effect relies on a series of application towards making your prediction correct using a simple to implement, yet hard to methodologically deduce, method. This effect allows for you to show that you have predicted any one spectator's Zodiac Sign within a group. Please note that this is not immediately repeatable for the exact same group, but that it can be easily reset between groups or tables. There are no gimmicks, gaffs, fakes, and at the most only ONE required piece of sleight of hand (which, many times, will itself not even be required). Only someone with a brain that works exactly like Dale's, that can approach a problem by evaluating and examining multiple approaches simultaneously, and can also turn this theoretical framework into a workable, and entertaining, presentation could invent such a thing. Don't get STRUCK with STARS in your eyes, by some other mentalist. Because if you don't learn this, someone else will. And they will slay you with "Star Struck".